We sponsor a child in India, so the opportunity to learn more about that country is something I tend to go for. Mother India, a short documentary film released today, was a great vehicle for getting a glimpse of life for (primarily) orphans in India. Winner of “Best Short Documentary” at the 2012 San Diego Christian Film Festival, Mother India is a compelling documentary that chronicles the adventure of 25 courageous orphans living as a family along the railway in Tenali, India. 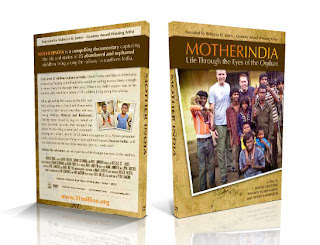 Mother India brings to light the struggles faced daily by over 31 million orphans in India and the challenge of rescuing them from a life of begging and addiction. We sat down to watch this as a family. Connor, 15, was reading aloud the subtitles as parts are not in English. That is something that adds some realism, and in the case of this film, it was nice as a lot of the subtitles. So, my advice would be that there is some subject matter in this documentary that you may not want your seven-year-old to be hearing. Life for these 25 kids isn't easy. There is talk of sexual abuse, the prevalence of AIDS, injections, beatings, etc. In spite of that, this isn't a depressing documentary. The overall message is one of hope, especially if kids can get some help early. Harvest India is one organization that is featured, and they certainly are a big, bright spot in this film. Mother India is well worth watching, and I think it can give teens and tweens a fresh perspective on life, and on life in other places. You might want to watch it yourself, though, before sharing it with younger children. I have a copy of this movie to give away too. Disclaimer: I received this DVD and an additional DVD for a giveaway for free through Blogger Gateway. No other compensation was received. The fact that I received a complimentary product does not guarantee a favorable review. All opinions expressed are mine, or those of my family. Sounds like an interesting one for my older kids! I would LOVE to win this because it sounds different than other documentary's we have watched in that it shows life through the children's eyes rather than showing them as just a statistic. My husband and I are praying about taking a mission trip to India in November. We would love to see this as we will be visiting some orphanages and a leper colony if we get to go.